Even though Memorial Day symbolizes the start of Summer for many, this past Thursday (6.21) marked the official first day of summer. What better excuse than the first day of summer to make a swimsuit? Truthfully I wanted to sew a swimsuit for my May post since it fell on Memorial weekend but I was distracted with the beautiful chambray that I used for a jumpsuit. 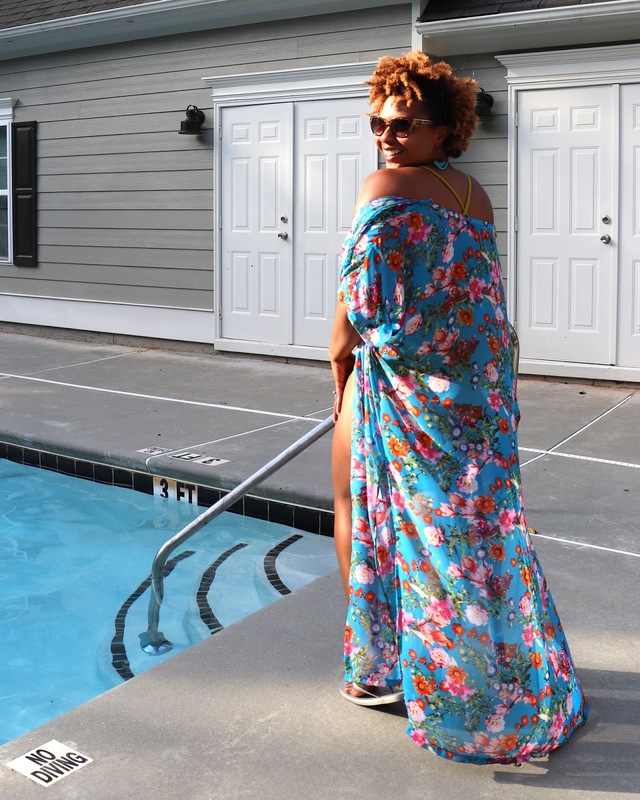 Since sewing just a swimsuit seemed a little "meh", I decided to add a cover-up for a whole "day at the pool or beach" vibe. This bright, floral chiffon screamed summer so I grabbed it. 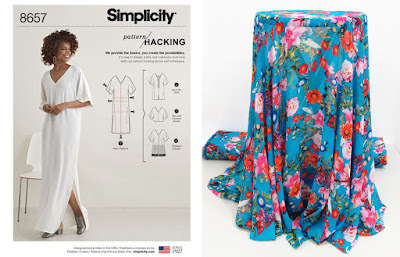 Sewing with chiffon can be frustrating so I chose Simplicity 8657 to limit the amount of seams. The only tip I have for sewing with chiffon is to use a rotary cutter and be patient. This print is still in stock, but some other prints that would work well is this similar spring green floral, this more abstract navy floral or this fun rainbow stripe. The only thing I don't care for is the lack of closure. I thought I wanted an open flowy look, but I would like it to stay closed so I will either add a snap or ties to the the front. Overall I like the pattern I definitely see myself making it out of a challis for the caftan look. When I can't make up my mind about which fabric to use or which pattern to sew I often take a poll on my Intsagram story, so if you'd like to give your 2 cents next time follow me there (TipStitched). So I asked Instagram to choose Vogue 9192 or Simplicity 1116 (OOP) and S1116 took the early lead. In the end the Vogue pattern won 57% to 43% but I'd already started by then. Ooops. This bright cover-up called for standout color swimsuit. This chartreuse swimwear knit is just that. This fabric is a good weight which is great for coverage but was a bit thick at the gathered sides (where I was sewing three layers of swim knit and a layer of mesh), but my machine handled it just fine (I did go slowly). The gathers at waist paired with wrap front of S1116 is a very flattering silhouette. 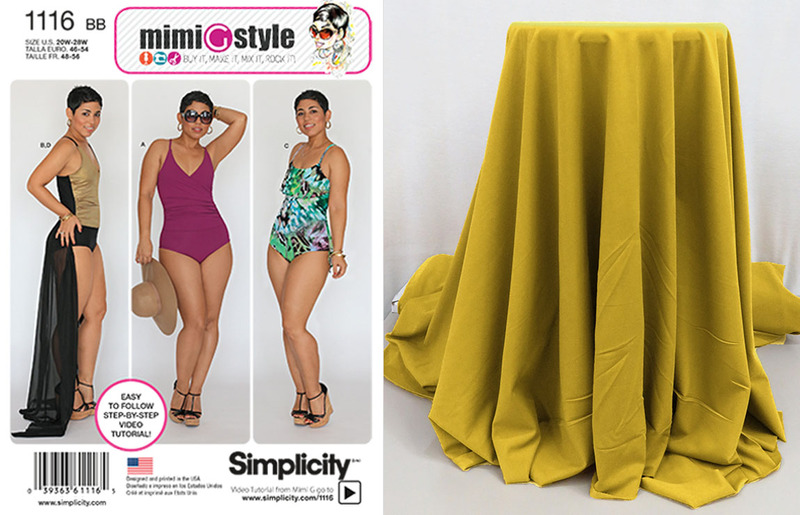 I love Mimi's patterns for Simplicity because she provides sew along video for each one. So if you've thought or dreamed about sewing a swimsuit, but have been a little intimidated, this is a great pattern for a first attempt as she walks you through each step. I did watch the video before I began sewing so I barely looked at the printed instructions. I am loving this bathing suit Tiffany! I purchased fabric to make a bathing suit about two years ago so I should probably pull it out. You have definitely inspired me. Love the cover up too. Thanks Johanna! You should definitely give it a try. I really like making swimsuits, they are quick sews. You did a wonderful job on both pieces and they look great on you! Tiffany, this looks great on you! Well done and that floral chiffon is the bomb! Love it on you, especially paired with the swimsuit! Thank you Sue! I do love the colors in the chiffon. The floral is so pretty, and this acid green is a fabulous color on you! Made by a Fabricista: Knit - Summer Hit and Miss! Made by a Fabricista: Polka dots for summer!